Upcoming Events and Fun Celebrations! Thanks to all who made our bowling event a big success! We are bowled over by your generosity! you can donate by clicking the link below! WHAT: Lots of fun, prizes ... and fundraising to help blind children read! DONATIONS ARE STILL WELCOME THROUGH 6-9-19! Every $100 you donate makes another 10 braille books for a child like Gabriella (pictured below)! $50 = 5 books, and every $10 = 1 book! Our goal is to raise a record $60,000 to make 6,000 braille books! or call 734-427-8552 for more information. THANK YOU! for all of your help and support! Every $10 puts another braille book in the hands of a child! and Community Service Project for students in the Detroit metro area! "Kids helping kids" makes this program exciting and unique. 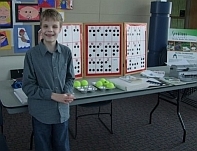 Students organize a community service fundraising project and Seedlings will present a fun, hands-on program about braille. By supporting a service project, your students will be making a difference for blind children and developing a pattern of generosity that will follow them throughout their lives! Contact Seedlings at info@seedlings.org or call 734-427-8552 for more information. If you like to bowl, please consider bowling to support braille book production! 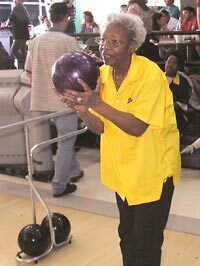 Seedlings' annual bowl-a-thon to support braille literacy has been our major fund-raiser for over 30 years! In 1998, a "Bowl Where You Are" option was added so that supporters across the country could participate! "Bowl Where You Are" has become so popular that we are making it a year round event! Individuals or groups are invited to bowl anywhere and anytime in the name of braille literacy to support Seedlings Braille Books for Children. Simply call us toll-free at 800-777-8552 and we'll send you instructions and a pledge sheet. When your pledges are collected and sent in, you'll be eligible for prizes! Every $10 raised subsidizes another braille book! Call today for details.